Optional table (bed) for the blackToe 2' x 4' CNC Machine kit. 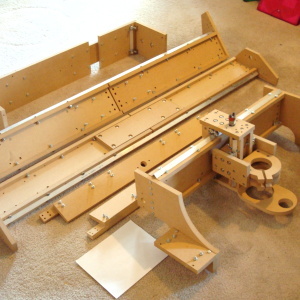 This is an optional table that is meant to be used with the blackToe 2'x4' CNC Machine kit. blackToe table: This video shows the general configuration for the optional table that can be paired with the blackToe CNC machine gantry. 1/4" - 1-1/2" length screws and cross dowels are used to fasten the table together. The video shows the table oriented with the bottom of the table showing so the configuration can be easily understood. The table top should have the counter bores facing up so the screw heads can be level with the surface.